Metrocitybooks.com offers books specializing in urban rapid transit; commuter rail, light rail & subway. 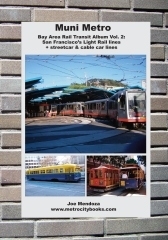 We have published our first book in our five part series on Bay Area urban rail. 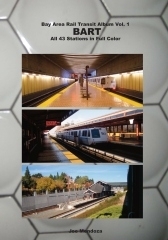 Our first book is a color album covering all 42 BART stations -San Francisco's regional rapid transit system - it is available below. Our second book will focus on San Francisco's Muni-Metro, the system that evolved when the streetcars were upgraded to light rail & routed through the Market Street Subway. JUST RELEASED: Our third book focues on Caltrain; the Peninsula Commuter rail. Click on our bookshop below and see what we have to offer. Take a journey through all 43 BART stations. 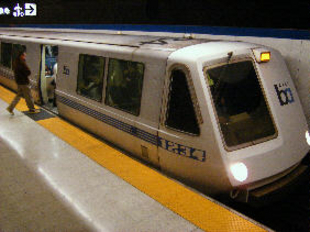 Visit San Francisco and the other cities and towns through which BART travels. In this, the first volume of the Bay Area Rail Transit Album series, we visit all 15 subway stations, all 15 grade level stations and all 13 elevated stations in the 104 mile BART system. Included are color photos and sections of all the stations. Most of the photos were taken at the end of 2009 and the beginning of 2010. Historic photographs are also included. 96 pages. Take a journey on San Francisco's Muni Metro system. Ride the light rail cars in the outer neighborhood, and then dip into San Francisco's tunnels and subway for a swift ride downtown. Visit all the Muni Metro underground stations and all handicap accessible stops on the surface. Then, after visiting Muni Metro, take a quick tour of the historic streetcars on Market Street, and the cable cars on Powell and California Streets. Included are color photos of all the stations and accessible stops. Most of these photos were taken at the end of 2009 and the beginning of 2010. Historic photographs are also included. 102 pages. Take a journey down San Francisco's peninsula on Caltrain, the commuter Rail line that runs from San Francisco, through the booming Silicone Valley and San Jose to the farmlands of Gilroy. See photos of all Caltrain stations taken from 2010 through 2015. Historic photographs are also included. Look for our other transit books.